FREE Wednesday Wisdom ‘Roundtable’ Discussion March 27 on Zoom. 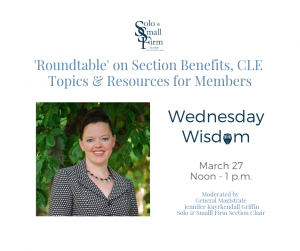 Solo & Small Firm Section members: Here’s your chance to provide feedback on section member benefits, CLE topics, resources and events that would benefit YOU! Join us for the next members-only Wednesday Wisdom event on March 27 at noon. Section Chair Jennifer Kuyrkendall Griffin will share ideas for potential new section benefits, get input into CLEs you want and listen to your ideas for how to move the section forward in ways that can benefit your practice. Long-Range Planning Meeting, Capital Hilton, Washington, D.C.